A man posing as Darth Vader attacked a Star Wars fan who had founded a Jedi Church, a court has heard. Arwel Wynne Hughes, 27, from Holyhead, Anglesey, admitted assaulting Barney Jones and cousin Michael with a metal crutch. They suffered minor injuries. Earlier, when Hughes failed to arrive on time, District Judge Andrew Shaw issued an arrest warrant, adding: "I hope the force will soon be with him." 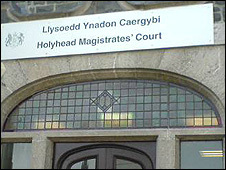 In the event, Hughes turned up and the case at Holyhead Magistrates' Court resumed. The court heard that he had jumped over a garden wall wearing the bin bag before the attack. Prosecutor Nia Lloyd said Barney Jones had recently started the Jedi Church in Holyhead, in honour of the good knights from Star Wars. It had about 30 members locally and "thousands worldwide," she said. 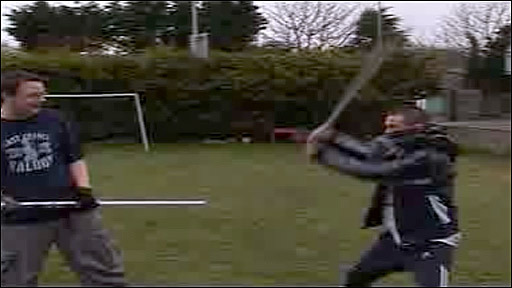 The cousins had been filming themselves playing with light sabres in the garden before the attack. Hughes admitted two charges of common assault. The court was told he had a "chronic alcohol problem" and had drunk the best part of a 10-litre box of wine. Mrs Lloyd said: "He was wearing a black bin bag and a cape and had a metal crutch in his hand." Hughes hit Barney Jones over the head with the crutch, leaving him with a headache, before laughing and hitting Michael Jones in the thigh, causing bruising. Both men were left upset by the incident and they believed it was pre-planned. She added that the pair believed "very strongly in the church and their religion". Hughes could not remember the incident and only realised what had happened when he read about it in local newspapers, the court was told. Defending, Frances Jones, said alcohol was "ruining his life" and he had no idea where he got the crutch from. The court heard that Hughes had previous convictions, including affray, assault and disorderly behaviour. The judge warned Hughes that jail remained a possibility, before adjourning for pre-sentence reports until 13 May.